Posted 27 January 2018 in Looking For The Awesome. Jack hated these periods of retrenchment; starting out fresh at a new company, with no chits, no position of strength, no ability to force your vision to the forefront. The companies were preset in their ways and visions. They had their own ideas of what a good comic book was. At DC, they had a vision of clean static drawings telling little tales provided by their in-house writers, like John Broome, or Gardner Fox as interpreted by Dan Barry, or Gil Kane. At Atlas, their ideal was a Bill Everett or Joe Maneely with their overwrought scratchy inking telling Stan Lee’s ironic tales. The new guy had to fit in and copy the house styles and fit into the accepted modes. Jack always had trouble fitting into other’s styles. Jack was a leader, not a follower; he hated having to copy another style. He hated having to prove himself one more time. He didn’t need to ape anyone else, let them ape him. But Jack needed to take care of his family, and his personal visions could take a back seat for a while. He would climb the mountain again—or build a new one. Artist Wally Wood once said “Never draw what you can copy. Never copy what you can trace. And never trace what you can cut out and paste down. Swiping gets a bad rap. It’s how we learn. What’s the first thing a teacher did? She went to a chalkboard and drew the letter A and told you to copy it. And you did! Why? Because she knew what she was doing. Many of these early comic artists were untrained, so they learned by copying what successful artists were doing. In many instances they were specifically told to copy other artists. Sometimes the swipes are direct, sometimes compositional and sometimes nothing more than thematic, but it’s still the passing on of knowledge. “The business of learning to cartoon should begin with an imitation of the working habits of the professional. But most important of all for the amateur is the collection and filing of an adequate morgue. This is the term used in all forms of commercial art to describe the check file of reference material from which the artist can get authentic research on detail whenever he needs it. Many amateurs think that a collection of this type isn’t ethical or honest. This is not true at all. It is impossible for any creative artist to have experience with all subjects likely to be demanded of him in his day-to-day drawing assignments. Nobody expects a cartoonist to be able to draw everything and anything with perfect accuracy…..
Jack’s early work was full of swipes. He swiped Segar in Socko the Seadog, Alex Raymond in several early stories and of course Hal Foster for the cover of Red Raven. Jack even swiped from a minor league artist at Fox Publications named Pierce Rice for his initial godlike poses for Mercury and Hercules. Joe’s early works were nothing but swipes. He wasn’t trained in the art of sequential storytelling like Kirby. His background was in composing and producing advertising copy for newspapers and magazines; jobs where swiping was expected. Stories like The Fiery Mask in Daring Comics #6 are nothing but Raymond swipes; even the smallest non-essential panels were swipes. One of the earliest and best swipe of a Kirby character was the cover of Blue Beetle #26, Oct 1943, Holyoke) This was swiped from the splashpage of the Manhunter story in Adventure Comics #73, April 1942. One of the more interesting swipes of Jack Kirby wasn’t even in a comic book. In 1950, a new sci-fi TV series was introduced. Tom Corbett-Space Cadet was written by Joseph Greene, based on the Robert Heinlein novel, Space Cadet. It became very popular, and soon other mediums picked it up. There was a radio program, a newspaper strip, and of course comic books–originally by Dell, but later by Prize Comics. There was also a series of juvenile hardbacks published by Grosset and Dunlap. The first title Stand by for Mars was published in 1952, written by Carey Rockwell and spot illustrated by Louis Glanzman, and had the great Willy Ley as technical advisor. Louis S. Glanzman was born in Virginia in 1922, and is one of the great illustrators of the last fifty years. He was self-taught, and began his career by illustrating comic books when he was sixteen, alongside his brother Sam. They made the rounds of the comic publishers in the early forties. Their art was simplistic and generic, but they found constant work for companies like Centaur and Harvey. He proceeded to work on the Air Force magazine in the 1940s, and illustrated many children’s books in the 1950s, including the Pippi Longstocking series and Tom Corbett series. In 1945 a one-shot titled K O Komics featured a reworked Guardian sketch on the cover. Though clearly produced during the war and signed JCA (Jason Comic Art-a small independent studio) the cover has been mistakenly credited to Jack Kirby. Jack Kirby would dip into his reference morgue every so often. Jack’s gorgeous cover to Foxhole #1 was copied from a war reporter’s painting. A wonderful Boy’s Ranch vista was swiped from a painting. A Police Trap splash was taken from an old photograph. Joe Simon elevated swiping to an artform. Whenever he felt the need to punch up a cover or panel, he would insert a swipe of a Jack Kirby figure. It made no difference if the styles were similar, or not. Many covers credited to Kirby are actually Simon constructs with Kirby swipes added in, especially on Harvey titles. The Fly and Double Life of Private Strong titles are uniquely assembled by overwhelming swiping. For the origin, Joe Simon claims that Jack took the script home and returned a few days later with beautiful pages “In my opinion, the best ever” This may have been so, but this didn’t stop Joe from redoing many panels of the Fly using Kirby swipes from Stuntman, and Fighting American. The reasons why are discussed in the chapter dealing with the Fly. 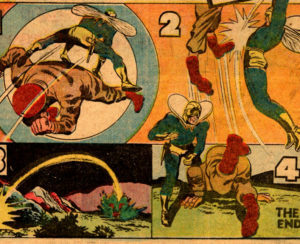 In the stories not drawn by Kirby, there are these odd insertions of Kirby swipes, usually when the hero is in action. Certain poses are reused in both series. It’s almost like Joe Simon gave the artists copies of Fighting American and told them to randomly pick out Kirby poses and throw them in. Some are mechanically precise, while some appear penciled freehand. The reworked stories in Fighting American are more problematic. Obviously reworking a previous Simon and Kirby Manhunter story is well within their rights, but taking a Jack Burnley, Starman story and reworking it into a FA story may cross the line. One or two panels maybe, but not the whole story and a dozen or more panels. That borders on outright plagiarism. It was cheesy and immoral. But when hurting for money, an artist must do what he must do. Even Joe’s biography cover is replete with Kirby swipes reworked. There is another aspect of swiping, though swiping isn’t the correct word. It is the constant revisiting of concepts’ elements, visuals whatever idea has lodged in their brain and catches their fancy. It is the nature of all artists to rework and evolve their ideas. Kirby was a persistent dabbler in that he constantly would revisit a concept, or an element, maybe just an image that intrigued him. It may be something as simple as an alien baby running amok that the heroes must tame. A favorite was the villainous painter seen in early Cap, Boy Commandos, The Fly and Marvel. The dangerous movie lot got a lot of visits-at all companies. In a later chapter I will talk about some other Kirby repeat patterns such as Hollywood movies and such. I literally could have chosen over a dozen examples of Jack reusing ideas, premises and elements. It is something he did his whole career. I use this a lot in tracking down whether an idea stemmed from Jack, Stan or Larry etc. The trail of Spider-Man shows that Jack reused ideas from his old partner as well. Fair enough—Joe certainly borrowed enough from Jack over the years.